Here are some of the healthiest, most delicious sweet potato recipes available. 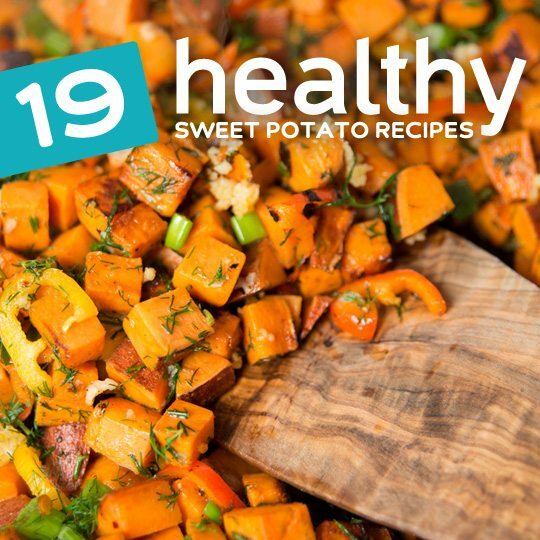 The incredibly versatile sweet potato can fill in for ordinary white potatoes in nearly every dish, and it brings with it antioxidants and fiber that regular potatoes just don’t have. It plays well with others, but also works well all by itself. Enjoy these healthy sweet potato recipes today and you may never look at sweet potatoes the same way again. Sweet potatoes make a great pizza topper, providing plenty of texture, and adding nutrients that many pizza toppings just don’t offer. This pizza is well balanced, with a flaxseed crust, chicken for protein, cottage cheese replacing mozzarella, spinach for phytonutrients, minerals, and added fiber, and of course the sweet potatoes, cut thick for added appeal. This is one pizza you won’t have to regret eating when you’re finished, and the recipe shows you how to make a single-serving size so it’s great when you want pizza but you’re flying solo. Kylie created something really special here, and in 30 minutes or less! 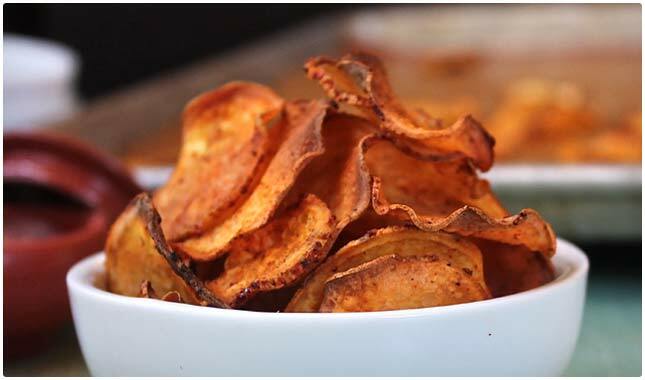 One way to make potato chips healthier is to make them without potatoes. Subbing in sweet potatoes immediately adds more to the equation in terms of vitamins, minerals, and antioxidants. You’ll also be getting fiber that you just don’t get from ordinary potato chips. With the addition of barbecue seasonings you’re getting one of the most popular potato chip flavors but on a healthy snack instead of one that will make you feel gross after eating it. They show you how to assemble all of the spices, and these are baked, not fried, so you’re skipping out on all of that oil. That’s right, you can turn sweet potatoes into brownies, and not just any brownies but chocolatey, delicious brownies that are loaded with fiber and antioxidants. There aren’t any grains used in these, with the sweet potatoes adding the necessary texture, along with coconut flour and tapioca starch. Only natural sweeteners are used here, so there are no refined or processed sugars to slow you down. This is a way to get your brownie fix without blowing your healthy eating intentions, and they’re great to share with family and friends. It’s not every day that you find sweet potatoes in brownies, so it’s a conversation starter as well. A baked sweet potato is a great foundation for just about whatever you want to pack inside it or place on top of it. Here they’ve decided to load it with a warm cannellini bean salad consisting of bell peppers, garlic, shallots, tomatoes, basil, and more so there’s a lot going on here. This can be used as a side dish along with a protein for a complete meal, or eaten by itself as a light meal when needed. The sweet potato will help you feel satiated longer, especially when combined with the beans and other ingredients. All of the flavors blend nicely, and there’s a good mixture of textures. Making a soup from sweet potatoes is a great idea. It will come out thick and creamy without the need of cream. This recipe shows you how to enjoy it with a harissa, a spicy chili sauce, and incorporates other vegetables into it, making it extra healthy. They’ve even managed to use peanut butter so you’ll get added protein and healthy fat. It includes turmeric and cumin, two powerful spices that will help your body in a number of ways, not least of which is helping to boost your metabolism. Overall, a knock-out soup you can add to your regular menu line-up. Sweet potato fries have shown up on many restaurant menus as an alternative to traditional french fries made from white potatoes. It’s often billed as a healthier option, and all else being equal it is, thanks to the added nutrients in sweet potatoes. 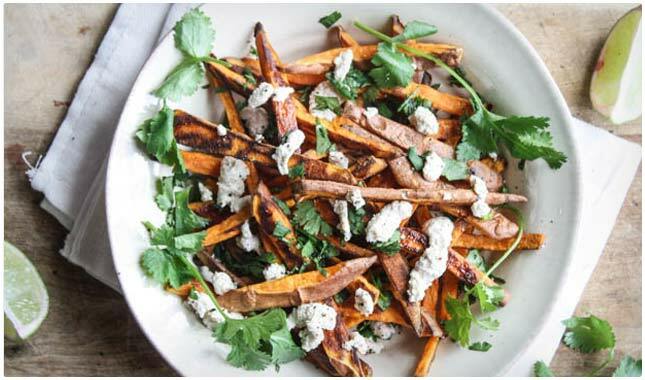 These sweet potato fries make a strong case for being your go-to side item for any main dish that would complement it. These are baked, and have a smokiness to them thanks to the smoked paprika. For the aioli, a traditionally fatty condiment, they’re using cashews so you’ll get healthy fats instead. Potatoes au gratin has to be one of the more popular potato side dishes in America, and you can replicate it here in a healthier format with sweet potatoes standing in for white potatoes. They’ve combined sweet potatoes with peppers and onions to form the au gratin, using parmesan cheese as a healthy cheese option. Added to that is panch phoron, a mixture of in this case five different spices, all combining for a very distinct flavor. This is a side dish that will pair well with chicken or beef, adding much-needed fiber to the meal and helping you feel satisfied long after the meal has finished. This modified Sloppy Joe recipe shows you just how versatile sweet potatoes can be. Instead of a bun they’re using spiralized sweet potatoes. And instead of using Sloppy Joe sauce from a can they’ve come up with their own healthier version so that you’re getting a protein, carb, and vegetables, making this a complete meal you don’t have to feel bad about eating. You’re taking out the bun, and subbing in sweet potatoes so there’s more fiber, and it’s a different form of carbohydrate so your body will digest this more easily. These quesadillas may just become your regular quesadilla option, and for good reason. They’re built from the ground up to be a healthier version of this popular dish, and sweet potatoes play a big part in that. The sweet potatoes will add substance to these, the same way that chicken or beef would, and although they’ve added shredded chicken to this, they do note that it’s optional, and could easily be made without it. There is a spinach hummus used as a topper, adding plenty of flavor and even more nutrition to the meal. This is a chili you won’t soon forget, with plenty of superfoods to keep you well-nourished and charged up the whole day. Sweet potatoes have been getting more and more press for just how healthy they are, and when they’re combined with a vegetable like kale that has been getting even more attention, you know you’re onto something. By using turkey instead of beef you’re getting less saturated fat but still getting plenty of protein. 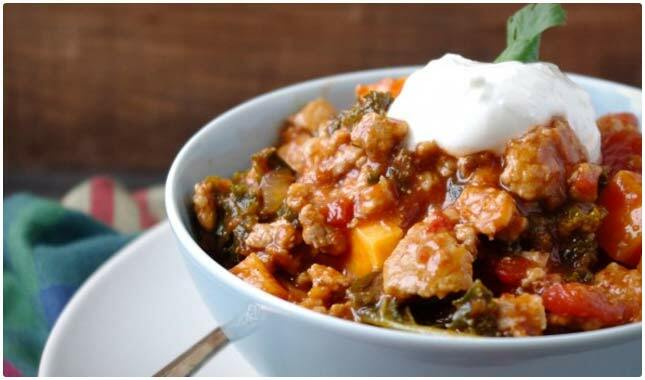 This chili provides an impressive mix of fiber, minerals, protein, vegetables, and the right kind of carbohydrates for a complete meal in a bowl. Here they’ll show you how to make Shepherd’s Pie two different ways. One is the more traditional way, with white potatoes, and the other uses sweet potatoes. The one we’re interested in is the one made with sweet potatoes, as it’s essentially the same recipe, but the sweet potatoes bring more to the table than white potatoes. The other ingredients she’s using are are hand-picked for their quality and their nutritional value. Take for example the way she’s using grass-fed beef for the beef, and making sure that it’s nice and lean. It’s this attention to detail that carries through to the entire recipe. Sweet potatoes have found a way into your breakfast menu, and now you can enjoy their flavor in pancake form. They’ve combined mashed up sweet potatoes with flour and oats so you’re going to get pancakes with some real substance to them, that stick-to-your-ribs feeling but without feeling bloated or stuffed. Usually you don’t get a vegetable serving along with your pancakes so these are something special. Serve these up with pure organic maple syrup and gobble them down just like you would traditional pancakes. Samosas usually can’t be counted as a healthy food, but they’ve made enough adjustment to them in this recipe that we were able to include them here. For starters, they’ve baked them instead of frying them, so there will be less fat overall. They’re using whole wheat tortillas to wrap them up instead of all-purpose flour. But perhaps the best substitute is the sweet potatoes for the white potatoes usually used in traditional samosas. The end result is a highly enjoyable side dish that won’t set you back, and instead includes plenty of ingredients and spices that help the body. A usually order of fish and chips is not something your doctor would recommend eating on a regular basis. But this version of fish and chips does its best to correct what’s wrong and bring you a healthy meal. The fish is coated in crushed almonds, providing a healthier breading, and the entire dish is baked, not fried, so you don’t have to worry about eating fried food and what that will do to your body. 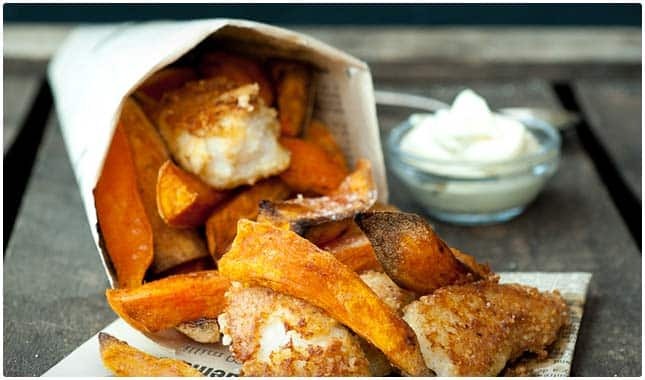 The regular chips have been replaced by sweet potato chips, sliced into wedges so you get the feel that you’re having fish and chips without the resulting larger waistline. Loaded potato skins are a popular appetizer, but it usually means eating a load of foods that aren’t good for you. These sweet potato boats are filled with ingredients that let you enjoy this without feeling guilty. They’ve kept the list of ingredients short, and have done their best to bring you maximum flavor without a bunch of fat and calories. You start with a sweet potato boat as a base, and build it up with black beans, a bit of cheese, and a yummy avocado cream sauce. Dip it in some salsa and you’re good to go! Somehow they’ve managed to make waffles out of sweet potatoes, and your taste buds are sure to appreciate this. It’s as easy as adding sweet potato puree to flour, with eggs and buttermilk just like a traditional waffle batter recipe. The only difference is that these waffles will have fiber in them that ordinary waffles don’t have. They’ll also have a good dose of Vitamin A and antioxidants thanks to the orange color of the sweet potatoes. If your kids don’t like to eat healthy foods this is a sneaky way to give them something good for them. If you like potato salad but don’t like all of the fat it brings, try this sweet potato salad as an alternative. It brings with it a lot of familiar textures, but it leaves out the mayo and subs in sweet potatoes for white potatoes, providing plenty of extra health benefits. Included in this salad are a bunch of supporting ingredients like black beans, onions, garlic, jalapenos, and plenty of herbs and seasonings to make it stand out. Great any time of year as a side dish, especially at barbecues to take the place of regular potato salad. If you’re trying to cut out some of the red meat from your diet, this is one veggie burger that doesn’t taste like a veggie burger. 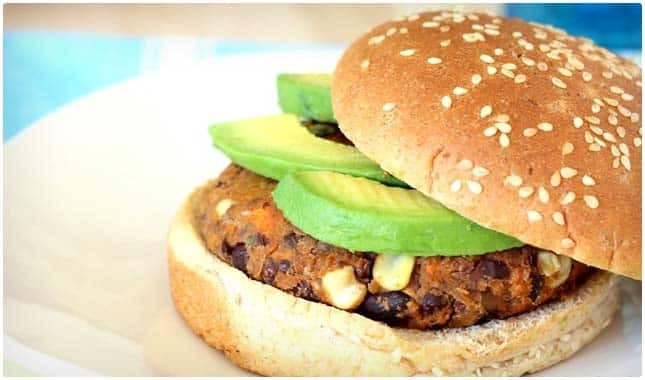 It’s made by combining sweet potatoes and black beans and forming them into a burger patty. There are plenty of other ingredients that help give this the right form and texture so you won’t feel like you’re eating a tofu burger or some other imposter. This is a great starter veggie burger for anyone that is a bit reluctant to cut back on their meat intake. Think about all of the fat you’re opting out of, and all of the fiber you’re getting instead. This is a way to keep breakfast a healthy meal, by replacing ordinary hash browns with sweet potato hash browns. These are a bit gourmet, with an aioli made from ketchup and fat free sour cream that you can drizzle on top. Pair this with a couple of eggs made in your favorite style and you’ve got a protein/carb combination that will have you soaring through your morning and right into lunch with no cravings or crashes. Who would have thought that a sweet potato could help you kick your coffee addiction?